How to create a low latency html5 channel? Our secure low latency html5 streaming solution is working on most of devices and all browsers except Safari desktop (working on Safari mobile for iOS version 10 and below). The reason is that we use Akamai’s standard cookie-based token authentication feature to secure our low latency html5 channels and third party cookies are not accepted in Safari desktop and iOS11 and above. Solution: you have the possibility to allow 3rd party cookies on Safari. 3)Click on the Security icon near the top of the window. 4)Under Accept Cookies the Always or Only from sites you navigate to must be selected. For more details and screenshot, click here. 1) For a free low latency html5 channel there is an expiration of 6 hours. Our low latency html5 streaming solution is available for existing customers who are premium plans and above. If you are on an event plan, please contact us. When you use your low latency html5 channels, please make sure they have been created after June 7th, 2017. 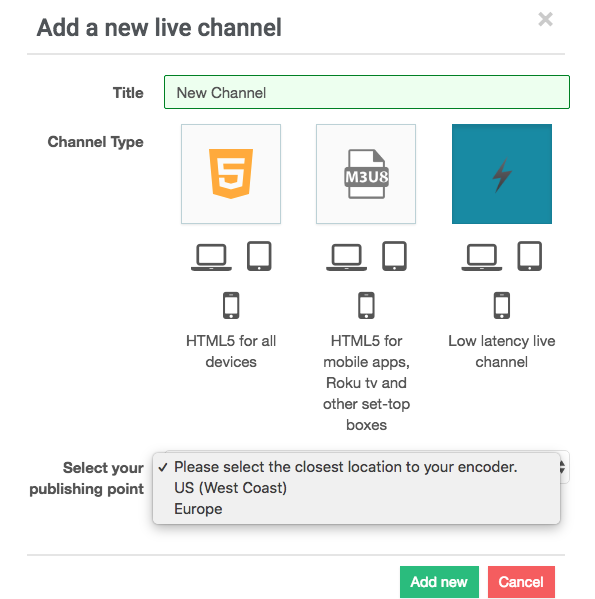 A window will open itself where you will be able to type the title of your live channel and select its type: html5 or low latency. Here you want to select low latency before clicking on CREATE. You will have the possibility to select the closest location to your encoder. Please note that by choosing the closest location to your encoder, you will optimize the performance of your stream and should get a latency around 8s (based on in-house testing with a 1500kBps). Last but not least, if not already, do not forget to turn ON your channel before you start streaming on it.